Inna Goncharenko summed up the results of her skaters at the Russian National Championships 2017. Inna Germanovna are you satisfied with Maxim Kovtun’s result? – You know the result and place are not the same thing. I would be pleased if Maxim showed clean skates of both programs. This is what every athlete and every coach aspires to and that’s what we wanted at the National Championships, because Max was ready to skate cleanly. But under certain circumstances happened what happened. According to my observation, it happened because of excessive desire of an athlete, he wanted it too much. But sometimes it’s necessary to restrain your urge. Maxim is emotional, you can see it in his programs. He’s not just skating, but expressing, dancing. It’s important for him. He moves forward in artistic and emotional terms. Develops. He can do difficult elements. It’s not easy to combine all of this, but it’s necessary. We started to work together not so long ago. It’s probably easier when you change a coach in childhood. For senior athletes with formed views, mentality, habits it’s much more difficult. All this is not so easy for Maxim, but he tries, in my opinion, he’s changing, turns into an interesting person, boyish starts to go away and he reveals gradually. But all competitions, especially before the New Year, are difficult. They also difficult for me, because everyone wants to perform as good as possible, but not all turns out. In addition, when I went with Lena to the Grand Prix Final, Maxim practiced without me. During this period, we had a peak of viral diseases in CSKA, which didn’t passed him by. We didn’t speak it out, but on the eve of a trip to Chelyabinsk Max got sick and then I also caught a cold. Of course, after an illness the body is weakened, but we did not want to hung up on it. At the Russian Championships Max had a good warm-up before the short program, it was clear that he is very well prepared. But he was unsettled that his wishes didn’t come true. He is a maximalist by nature: either all or nothing, that’s what he has to learn how to fight, to have a more philosophical attitude to everything. Maxim Trankov, commenting on Kovtun’s performance, said that perhaps the athlete should take a step back, to make programs easier, to work them out and then go to the complication. What do you think? 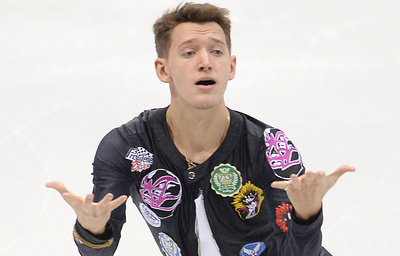 – Kovtun can skate a program with three quads. We made the free program easier, he has two quads. It’s possible to do two identical quads, it is always easier. But I think that before the Olympic Games it’s a wrong time to simplify something. It’s better to have your own mistakes, to work on them faster. Perhaps, what Maxim Trankov said, was necessary to do before. This season, in connection with the coach change, some other problems we are a little bit late, but we’ll make up. Max has a lot of fans. I get a lot of warm words from people who support us. Everyone understands that it is not easy. It’s nice that there are people who believe in us, who love us. I want to thank those who help us – in word, deed, advice, attention. I wish you happiness and health, let the troubles and problems remain in the past leap year. Will the bronze of Russian Nationals become a springboard for Kovtun? – I think it will, because Russian Nationals are a selection into the national team, selection for the European Championships, that was our goal and we got it. If not a victory then the second, the third place, there’s no big difference, these are places of honor, so everything is fine. Now we need to prepare for the European Championships, and I would like to wish Maxim luck. In sports and life there are situations when everything seems good, but something does not work, in this situations you just need a little luck. What happened with Sergei Voronov? – Sergei started the season very well. Worthy, he improved, from start to start he was going confidently. But in went out a bit confused on his free program in Chelyabinsk. We decided to do two quads. This is what is called pure mathematics, it was necessary to add the combination to his first jump, as he usually does. But even the worthy Homer sometimes nods. Of course, Sergei was upset. I personally believe that the seventh place is not his. At a minimum, he should have been 6th. Sergei looked exhausted after all of this: scores, place at which he was put. I do not think he showed horrible skating. Although I do not condone the athlete, no one should pop the jumps. It seems to me that Voronov has already sufficiently demonstrated that he is ready to fight for the top places at a decent level, he performed well at international competitions. I’m sorry, and I don’t hide that I’m upset. Everyone has their age, their time, and all this talks about age in the sport seem to me out of place. Someone may be a retirement in 15-16 years and you’ll want to say him “Finish”, my tongue refuses to say such things to Voronov. All season Sergei skated with pleasure. When the skater comes to such a state when he gets pleasure from his skating, from what he brings to people and the audience feels it too, this is a masterstroke. It is worth to stay in the sport. What is happening with Elena Radionova? – The man, an athlete, especially girls, is growing, changing not only in appearance but also forming psychologically. At some point, Lena from a fighting child turned into a stately lady, languid, mysterious, beautiful, and it affected her mindset. I didn’t see what I have seen before, such an mindset “I will go and for sure will be first”. There appeared some kind of narcissism, pitying herself. But Lena finally comes out of this state. A little late for that season an athlete became as she has always been, as we say “to tear them all to pieces”. Yes, she’s bit late, but not all at once. Lena is Lena. She is a leader, a fighter. It is not easy, but she tries. She has rethought a lot and that’s good. Radionova was, is and will be. I have never doubted it. She never gives up, and I will not give up ever. We competed, compete and will compete, will complicate the programs and go forward. Many people support us. I have a friend abroad Natasha Popova, she helps us tremendously with the music, and not only with music, she doesn’t osleep at night watching, cheering. And there are many of such people. We can not let them down. Everyone loves Lena. Not only me, Tatiana (Tarasova – ed. ), Sasha Uspenskiy, Anna Bilibina, but also a huge number of fans. Lena, with her opened for the world eyes is a very sunny person. And when she skates, for me it is something divine, something that you want to watch. On the eve of the New Year what would like to wish to all your skaters? – To fight, to seek, to find and not to give up. Athletes always have to fight and not to give up ever. Life is a complicated thing. Sometimes it seems that everything is over, then just opens a second breath. I want their second, third, tenth breath not to end ever. Love what Inna said. I hope that Sergei will not retire after this year. If he has fun, we have fun. Let’s hope he will have his moment of shine next season! I agree, she’s always smiling, even when things don’t go the right way. I like her a lot because she drives a lot of joy. Even through hard time and mistakes, everyone can clearly see his love for skating when she skates. I think she’s a good exemple for any young skating girls as she keeps fighting and still joyful whatever happens. I wish her good luck! I agree! She is fun to watch because you know she is enjoying it. I really like her! Yeah, Kovtun really needs help with the fighting aspect of things. He just gives up when things get tough. I’m American and I can’t begin to tell you how impressed I am by many of the posters on FS command of the English language. I’ve studied a number of languages (even Russian) and I never reached your levels of fluency. And I love how readers use expressions from their native language translated into English.